(PhysOrg.com) — University of Maine volcanologist Andrei Kurbatov and glaciologist Paul Mayewski, along with 21 other scientists, coauthored a scientific paper released late last month that details the discovery of a layer of nanodiamonds in the Greenland ice sheet, which has added to a controversy in the scientific community about a possible extraterrestrial impact event that could shed light on why some types of large mammals disappeared around 12,900 years ago. 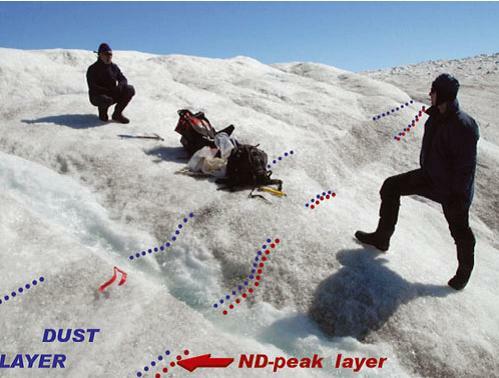 The paper, which was published in the International Glaciological Society’s Journal of Glaciology, Glaciological Society, includes the findings of UMaine scientists Kurbatov and Mayewski, who traveled several times to Greenland more than two years ago to test for the presence of nanodiamonds in the ice sheet from the Younger Dryas (YD) time period. During the YD era, the climate returned to near-glacial conditions of earlier ice ages. This time period corresponds with the disappearance of animals such as mammoths and saber-toothed tigers. Although the Greenland paper was only recently published, the nanodiamond discovery was the subject of a February 2009 episode of the PBS television show NOVA. The episode featured Mayewski, the director of UMaine’s Climate Change Institute, and Kurbatov, a CCI faculty member who was the lead author on the paper. The UMaine scientists and a Danish colleague, Jorgen P. Steffensen, provided expertise related to the flow dynamics along the edge of the Greenland ice sheet, and the chemical analyses required to understand the climatic significance of a section of ice recovered by the team. 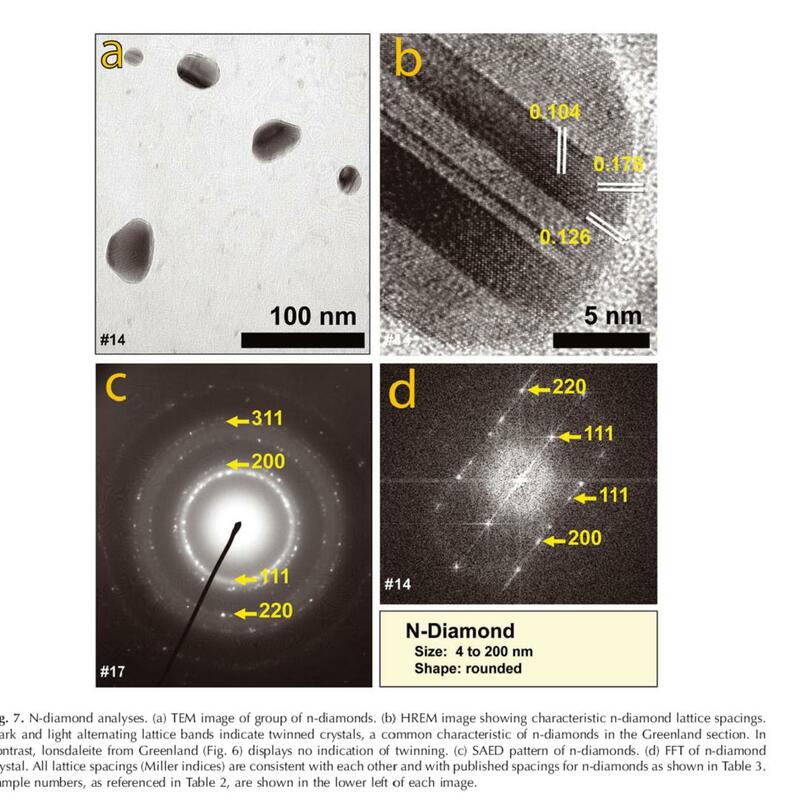 A team of co-authors at the University of California, Santa Barbara, University of Oregon and Northern Arizona University tested for and determined the presence of the nanodiamonds, which are smaller than a virus and therefore cannot be seen by the naked eye. Mayewski says this is the first discovery of a heavy concentration of a discreet layer of extraterrestrial matter in the Greenland ice sheet. The amount of nanodiamonds found in the layer is up to 5 million times more concentrated than anything else around it. 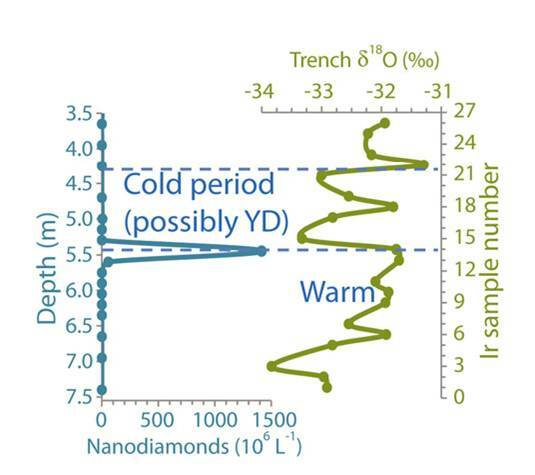 Although the paper states the nanodiamonds are present, Mayewskis says the timing of deposition to the ice sheet of the microscopic substance is somewhat unclear. One form of nanodiamond found in the sample was lonsdaleite, which is only known to form during high-temperature, high-pressure cosmic events. The prevailing theories for the disappearance of the animals include climate change and over-hunting by the people of the Clovis culture, who were the first well-documented prehistorical hunters. However, the presence of lonsdaleite and other nanodiamonds in a layer of ice that could have existed in the Younger Dryas provides fuel for a theory, held by some scientists, that an extraterrestrial impact event, such as a meteorite impact and/or an airburst, led to conditions that altered the earth’s climate and sparked the Younger Dryas. Other scientists and researchers who have examined the Younger Dryas age records in sediments recovered on land, however, recently published a paper that claimed the particles identified as lonsdaleite in the layer were actually a material similar to graphite, called graphene, which would disprove the theory of an extraterrestrial impact. However, the evidence presented in the Greenland paper contradicts that contention as multiple types of analyses all confirm the nanoparticles recovered from the Greenland ice include lonsdaleite and other nanodiamonds, rather than graphene or other minerals. Some scientists have speculated that the melting of a glacial lake, which would have released fresh water into the North Atlantic and upset the ocean’s circulation, drove down temperatures and sparked the Younger Dryas.